I’m such a dummy. I was off an entire month last week. I would have rather reminisced about this or the Matrix lean if I had selected October 2011. Whatever. I doubt anybody is too upset. Actually, it would be pretty funny if they were. I wish I could get organized enough to make it a contest. I’d love to read complaints from people stating how being off a month in the Stir Up Saturday wrecked their weekend or offended them. Feel free to post your complaints in the Comments below. Maybe it could be turned into a contest? But then I kept scrolling. I found something that made me laugh a little bit. The Comments of Auction Watch #82. I still can’t imagine how a person could ever fail to understand the vast complexity of Auction Watch. An argument could be made about “reading comprehension” but even if it was zero, on a scale of one-to-ten, you don’t get to this website by accident. Reading comprehension is the most difficult when you don’t understand a topic or have any familiarity with it. 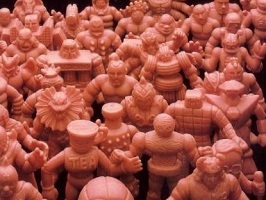 If you come to this site, then you know something about M.U.S.C.L.E. figures. If you’re reading Auction Watch as a M.U.S.C.L.E. collector, then you probably know a little bit about ongoing auctions. To be dumfounded, and then argue the point, of predicting a final value still mystifies me. I can only laugh. Then I clumsily hit the Page Down button and I was laughing again. Was Steve the AOTW? Is Steve still pissed? What was he pissed about to begin with? I’m just glad Steve cared enough to read and leave a comment. Do you guys care that much? This entry was posted on Saturday, October 15th, 2016 and is filed under UofM News. You can follow any responses to this entry through RSS 2.0. You can skip to the end and leave a response. Pinging is currently not allowed.